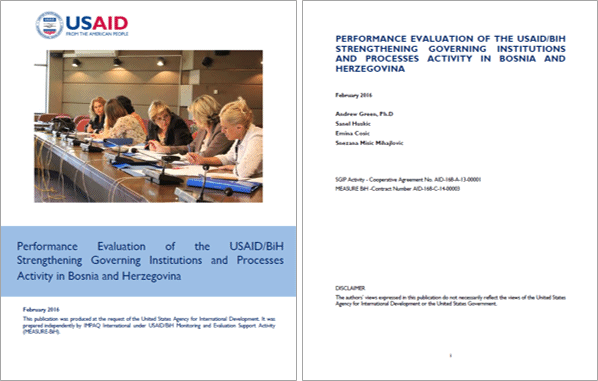 Performance evaluation of Strengthening Governing Institutions and Processes (SGIP) activity is the first performance evaluation conducted by MEASURE-BiH for USAID-BiH. SGIP supports BiH efforts toward Euro-Atlantic integration by strengthening the capacity of the country’s governing institutions to adopt, implement, and account for more effective policies, laws, and budgets that address critical EU accession related issues. SGIP began in May 2013, is scheduled to end in January 2017, with a total estimated cost of $5.9 million. The purposes of this performance evaluation are to: (1) assess SGIP’s progress toward stated objectives; (2) identify obstacles to SGIP implementation; and (3) provide recommendations for activity design adjustments for the remainder of the activity, including whether to extend the period of performance. To what extent has SGIP’s work with local partners, including host-country government counterparts, strengthened their capacities in policy development, law-making, and communication and outreach with the public? What results have been achieved when audit methodologies developed by SUNY were applied by parliamentary committees? How well have gender issues been addressed by SGIP? What factors, including external factors, are contributing to (or inhibiting) significantly the achievement of program objectives? To what extent has SGIP ensured synergy and cooperation with other USAID projects and international donors in providing support to targeted partners? Evaluation Team applied standard rapid appraisal methods of materials review and semi-structured interviews of key informants to collect data for analysis. All qualitative and quantitative data were carefully managed to ensure fluid identification of trends and outcomes. Parallel analysis was used on the evidence from the materials review and semi-structured interviews.